*Other Mission Pages: California LDS Missions. Here’s a recent address for the California Irvine Mission. We try to keep this info up to date, but it’s a good idea to check the address with several sources, including your mission packet or the mission office. Mission President: President Samuel W. Clark Jr.
Here’s a list of LDS missionary blogs for the California Irvine Mission. This list includes the missionary’s name, URL and when their blog was updated. 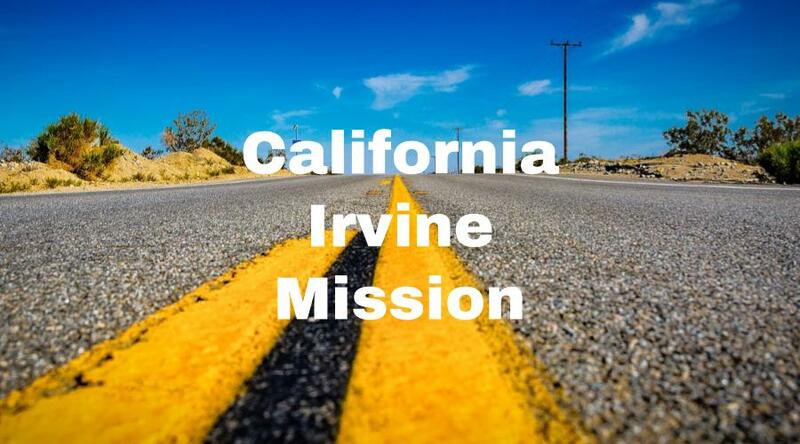 Here are California Irvine Mission Groups- for LDS missionary moms, returned missionaries, mission presidents and other alumni of the Irvine Mission. Here are T-shirts for the California Irvine Mission! 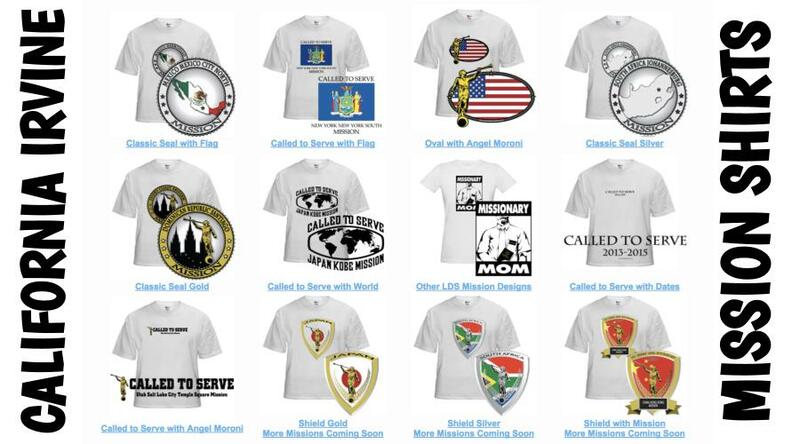 Shirt designs include California Irvine Mission logo/emblem shirts and Called to Serve shirts. The shirts make great gifts for pre-missionaries, returned missionaries and missionaries currently serving. LDS Mission shirts come in all sizes: Small, Medium, Large, Extra Large, up to 4XL. The mission designs are printed on white shirts and are shipped to you. *Simply click on a shirt design to view the details and submit an order. The designs on mission t-shirts may also be printed on other LDS mission gifts, including: California Irvine missionary aprons, Christmas stockings, ties, pillow cases, teddy bears and Christmas ornaments. Here’s a list of current and past Mission Presidents of the Irvine LDS Mission. 2016-2019, Samuel W. Clark Jr. Here are survey responses from California Irvine RMs, to give you a snapshot into what it’s like to live in the mission. What are some interesting facts about the Irvine Mission? Any advice/testimony for pre-missionaries going to Irvine? The Anaheim and Carlsbad missions gave up pieces to form the California Irvine mission. The principle cities are Irvine, Newport Beach, San Clameni. and Laguna Beach. I served as a Mandarin speaking missionary. The majority of the Asian and Mandarin population lived in Irvine itself. The southern part of the mission was primarily Hispanic and White. There are about 6 or 7 stakes in the Irvine mission, and each one has about 2,000 or more members. When I left the mission, there were a little over 200 missionaries because of the age change. I really miss the weather in Irvine. The weather is warm and sunny almost year round, although in the winter it could get a bit chilly. The areas are generally biking areas, with missionaries only having cars in the areas that are more spread out. Each ward would generally have two companionships of missionaries. We were very fortunate to have the Newport Beach temple within our mission boundaries. We got to attend the temple every other transfer. The church is growing a lot in the Irvine area. There are a lot of members, and the youth especially are very strong. Try to build a strong relationship with them, and you will see a lot of miracles as they reach out to and share the gospel with friends. The languages in the Irvine mission are English, Spanish, Mandarine, and Marshallese. A new Marshallese branch recently was opened in the Newport Beach Stake. The Irvine mission is composed of six stakes. From South to North you have San Clameni, Mission Viejo, Lagoon Legal, Rancho San Margarita, Irvine, and then Newport. We cover much of Orange County, and the majority of the residents were middle and upper class. It was a very mainstream place of California, right along the beach. The Languages spoken in the mission were English, Spanish, Mandarin, and a new branch of Marshallese. The amount of diversity made the region very unique, and it was interesting to see the melting pot. Church History does exist in the area. The Mormon Battalion actually marched through San Juan Capitano. Every year, the members will participate in a parade that commemorates their march. The wards in California comprise of 150-250 active members, with a similar amount of less actives in each area. The church is definitely a known presence in California, and many will recognize the missionaries before you even talk to them. But, because of the amount of diversity and immigration, there’s a lot of people who’ve never heard of the Church. One of the biggest emphasis on my mission was finding people. One of the most important skills was striking up a conversation with people. When you’re going from appointment to appointment, don’t just stay on your car or bike, but stop and talk to everyone you see. As a missionary, you should pray for families to teach, or the opportunity to build families at least. Families are the Lord’s plan for us, so that is your purpose as a missionary. The California Irvine mission is one of the smallest in the world. It doesn’t take long to travel across, but it’s full of people. The boundaries go from Costa Mesa, which is just North of Newport, down to a little bit of Camp Hamilton, which is a military base. The Newport Beach temple has been there for about 10 years. It’s interesting because the members actually paid for it themselves. Local communities didn’t want the temple to be built there, so the members and the church had to work a lot with residents to help it be built. It was nice to have a temple in our mission and be able to go every other transfer. You could tell that the members in the area love the temple and they used it a lot. In the Orange County area there are a lot of different churches. I remember driving down a single street and seeing five or six different religions or churches. We had diversity all the way from Atheists to Born-again Christians. This range played a huge role in missionary work. Some people felt they were already religious enough and didn’t want to change. People were more receptive when we could connect with them and then show them what was unique about the Gospel of Christ. The Irvine Mission was taken from the Carlsbad and Anaheim missions. Our mission president, Von Orvile had served as president of the Polynesian center, and he brought with him a lot of the Hawaian and Polynesian culture. Polynesians have a lot of love and charity, and he helped the mission to feel like a family. You could see this light about him, and you could tell that he was a disciple of Christ. Finding was one of the most important, and difficult parts of the mission. Even if you already have investigators close to baptism, you need to find more. What helped the most was working with the members. If you don’t work with the members, nothing is going to get done. You have a lot of members who are pretty well off, and even if they’re not, they’re happy cause they’re close to the beach. It was hard for non-members to trust two random guys in white shirts, but if the members talked to their friends, people were a lot more open. Member missionary work was key, but it was also important to try other finding methods like contacting new people or helping less active members come back. I was called to serve English speaking, but I learned some Marshallese as well. My mission was from 2013 to 2015. I served in Irvine, Laguna Beach, Costa Mesa, Forester Ranch, and San Juan Capistrano. Irvine was my only inland area, and the rest of my areas were all on the coast.